Revenue cycle issues such as coding, charge capture, and denials management are among the top risk areas for healthcare organizations in 2019, according to a report from Crowe, a public accounting, consulting and technology firm. As reported in Becker's Hospital Review, the analysis is based on assessments of nearly 3,000 risks in 2018 for more than 250 hospitals, health systems, physician practices and other healthcare entities. To determine top risk areas, Crowe examined how often a risk was included in assessments by healthcare entities. Researchers said they also considered each risk's effect on the healthcare entity and how likely the risk will negatively affect patient care, regulatory compliance, and other critical goals. Coding: The effective evaluation of ICD-10-CM, ICD-10-PCS, and CPT/HCPCS coding and billing compliance has both significant regulatory challenges, as well as bottom line challenges. Common coding challenges include lack of adequate physician documentation and increased workloads due to the complexity of coding guidelines. Charge Capture: Significant risks relate to the accuracy and completeness of charges, especially where new technology is in use and where high-dollar procedures and services are involved, such as surgery and cardiology. 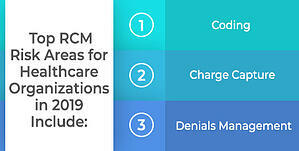 Denials Management: Denied claims result in expensive rework and oftentimes can lead to lost reimbursement. Healthcare organizations must have procedures for effective denials management and third-party payer follow-up. Aviacode is your experienced coding partner. We can help you identify and remedy these risks with high-quality coding, consulting, and QA in 2019 and beyond.